Extreame Savings Item! Save 43% on the Magnetic Behavior Chalkboard Chore Chart - 17''x11'' - Dry Erase Refrigerator Reward Incentive for Kids - Reusable Monthly Calendar - Multiple Family Responsibility Magnet - Toddler Children Teen Adult by Lushleaf Designs at PPC Think. MPN: lushleaf-magnetic-chore. Hurry! Limited time offer. Offer valid only while supplies last. ✓ PERFORMANCE & SATISFACTION GUARANTEED - We know you'll love our schedule task boards that are proudly designed and printed in USA. That is why we are dedicated to your satisfaction and will only provide you with the finest product and service around, or your MONEY BACK! Get your functional dayminder magnets now! Simply click "ADD TO CART" and "CHECKOUT". It is a small investment that will deliver tremendous benefits! 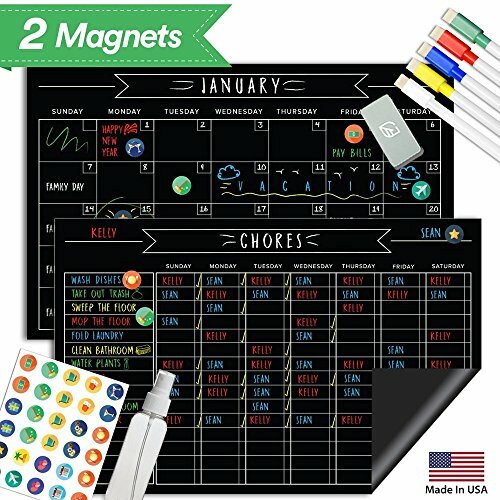 ✓ CONVENIENT & EFFECTIVE - While other magnetic star charts and calendars are too weak, hard to erase, or arrives with damages, Lushleaf Designs Black Magnetic Set is made with the highest grade 20mil magnet, overlayed with long lasting premium dry erase laminate, and shipped with a cardboard backing to ensure that you will receive the product in perfect, mint condition. This means a trouble-free, at a glance reminder method for your family and cleaner, neater, and more organized home for you. ✓ GOOD BYE CHAOS - No need to come home to a mess of toys, dirty dishes, unfolded clothes and constantly reminding everyone to finish their chores. Our activity organizational reward charts will restore order and sanity to your everyday life, saving you energy and keeping everyone happy, organized, and self-sufficient. Reusable and easy to use for anyone; toddlers, children, teens, adults. No ghosting or staining so you can keep planning day after day and year after year with total confidence! ✓ INSTANT FAMILY COLLABORATION - We believe in making everyday life easy and fun and that in helping you do this in your own household, we are creating happier moms and happier families. Customer Reviews: "It has helped our family out hugely", "Incentive for my daughter to try new foods. Nothing we've done in the past has worked, but... knowing that she gets a prize at the end of the week has actually worked! ", "My kids are more engaged... it is so easy to use that I actually stay on top of it!"